Electronic fetal heart rate monitoring has been around for a long time. Technology has evolved rapidly, while the older technology also continues to be used effectively. Noninvasive monitoring using Doppler ultrasound based monitors is sensitive and is used widely. A number of errors are possible, either due to machine malfunction or patient-related factors. A new error due to machine malfunction is described here. Phillipe LeGaust first described fetal heart tones in the 17th century in his poetry in an ancient French dialect. He had actually picked it up from his friend Marsac who was a physician in Limousin, who gets credit for hearing the fetal heart sounds for the first time. Lejumeau Kergaradec, a French nobleman, suggested that auscultation could be of value in the diagnosis of pregnancy and twins, and also in determining fetal lie and presentation. Evory Kennedy of Dublin published a book entitled 'Observations on Obstetric Auscultation' in 1833. He also described the funic souffle for the first time. DeLee-Hillis stethoscope used to auscultate fetal heart sounds was described by Hillis and DeLee independently. [2,3] Kilian first proposed that changes in the fetal heart rate might be used to diagnose fetal distress. Von Winckel described in 1893 the criteria of fetal distress. Cremer, a German physiologist, used a galvanometer to obtain the first recording of FHR in 1906. He recorded the FHR electronically for the first time, using of abdominal and intravaginal leads in 1906. Hammacher and Hewlett-Packard produced the first commercially available fetal monitor based on external tocography and phonocardiography in 1968. 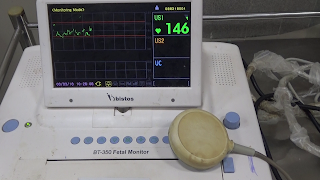 More recently Doppler ultrasound has been used extensively to provide FHR signals for monitoring fetal well being. A number of errors are associated with electronic FHR monitoring, either due to amchine malfunction or patient-related factors. A new machine error is described here. 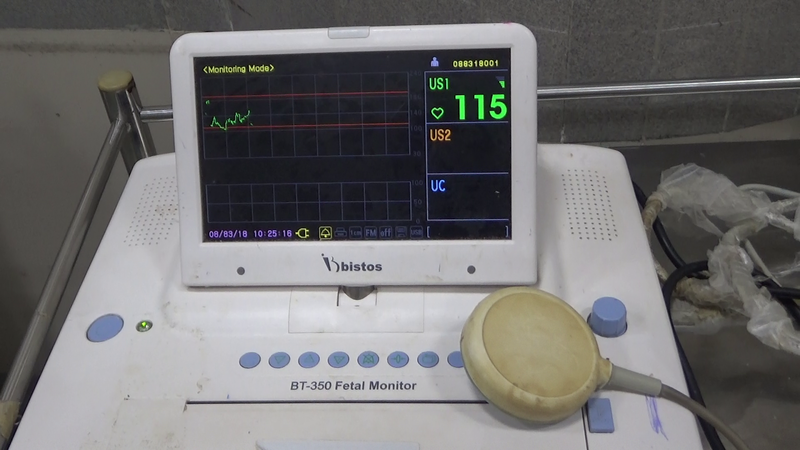 An fetal electronic heart rate (FHR) monitor was being used in the labor ward for intrapartum recording using a Doppler external transducer. The display on the LCD screen showed a normal pattern, with good beat-to-beat variability as well as long term variability. The audio signal of fetal heart sounds was also satisfactory. However the resident doctor using the machine noticed that the monitor continued to show a satisfactory FHR tracing and the audio signal continued as before even after the transducer was removed from the patient’s abdomen. A machine error was diagnosed. The occurrence of the error was documented on a video. Owing to an inability to display the video in a journal article, snapshots of the video obtained at different times are shown below. Figure 1. Early part of the record. Figure 2. A record obtained some time after the first one. Figure 3. A record obtained much later. In troubleshooting of the machine, it was switched off and then on. The error continued. The transducer was removed from the machine, at which point it promptly displayed an error that the transducer port was empty. The error resumed when the transducer was connected to the port. The transducer was substituted with another functioning transducer, and the error still remained. The transducer was put on another machine and it functioned properly, without any error. So a tentative diagnosis of an error in the motherboard (printed circuit board) of the machine was made. The machine was sent to the manufacturer for repairs. The diagnosis of damage to the motherboard was confirmed. It is not necessary to use a direct fetal ECG signal to record the FHR in the antenatal period and most often in intrapartum period. An instrument which functions on the Doppler principle is adequate for this purpose. [6-8] Ultrasonic beam passes through soft tissues and gets reflected partly when it encounters an interface of increased density. The reflected signal undergoes a frequency change called Doppler shift if the interface is moving. If the movement is away from the signal source, the frequency decreases and if it is toward the signal source, it increases. Older instruments and many of the newer instruments use multiple crystals in the transducer to transmit the signal and receive the reflected signals continuously. Newer machines use a pulsed Doppler in which the emission of ultrasound waves and the reception of the reflected waves are alternated. This decreases the amount and duration of fetal exposure to ultrasound energy. 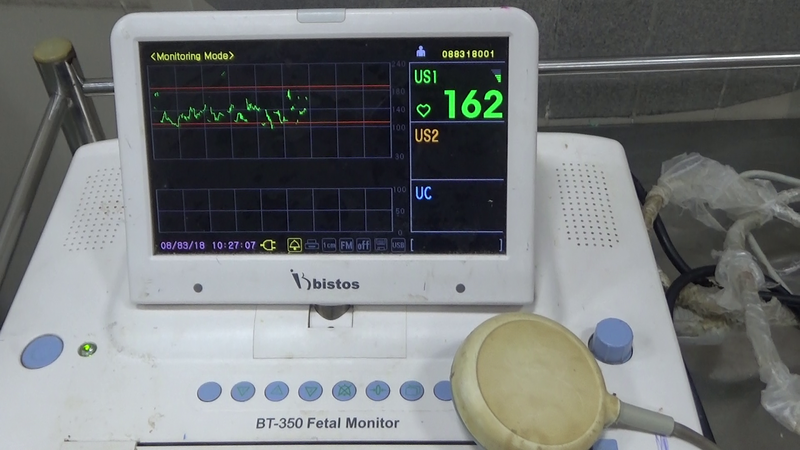 The rhythmic movement of the fetal heart produces Doppler shifts which enable recording of FHR and production of fetal heart sounds which can be heard. Many errors can occur with this system. The signal is interefered with by maternal muscle movements, change of position or uterine contractions and fetal movements away from the transducer. Loss of alignment between the ultrasonic beam and moving surface of the fetal heart can result in loss of FHR signal and erroneous records. Sometimes there is halving of FHR when above 240 due to electronic logic used by the machine to produce a FHR that is in the range which is acceptable to the clinician. It also occurred in earlier machines when a large P wave was counted in addition to R wave. If maternal aortic blood flow signal is strong, it may be picked up and recorded as FHR. This tends to occur also when the fetus is dead and only signal available for being picked up is that from the maternal aorta. There can be an apparent increase in short-term variability due to detection and recording of the highest point of the waveform, even if it may not appear at the same time in each successive waveform. This error varying waveform amplitude problems is minimized or eliminated by the use of high-speed microprocessor integrated circuitry to achieve autocorrelation to FHR technology. 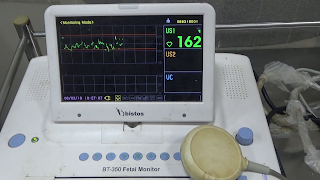 A number of such technologies are being evolved, such as the STAN monitor, the Monica AN24 monitor, the MindChild MERIDIAN monitor, and an FHR monitoring system based on radiofrequency technology. The use of any new technology needs to be done with some caution. A failure to consider various sources of error during manufacture of the equipment and writing the code for function of the processor can result in serious errors. The case described here is the first report of such an error. It was due to a fault developed in the motherboard of the machine. Discussion of the electronics of the error is beyond the scope of this article. But if attention is not paid to the FHR recording by the clinician, then a record may be obtained which will be totally different from the actual FHR, giving false security and decisions based on that record may result in serious adverse consequences for the fetus. The resultant litigations against the clinician will prove very costly, though the fault lies with the manufacturer and the maintenance engineer. Compensations will be awarded to the patients because the clinician is expected to detect malfunction of the equipment he uses and get it repaired as soon as it is detected. Total reliance on machines is not justifiable, since auscultation of FHR is a time tested and proved method of FHR monitoring, and cannot be given up because a machine can do the job. Though modern monitoring equipment is far superior to the human senses of hearing, seeing and touching, it should be used with caution. Electronic equipment can malfunction in ways that are diverse and not always easily noticeable. Periodic checking of the equipment by maintenance personnel and by the clinicians would help prevent morbidity and mortality for the patients and lawsuits for negligence by the clinicians. Kennedy E. Observations on Obstetric Auscultation. Hodges and Smith, Dublin, 1833. Hillis DS. Attachment for the stethoscope. JAMA 1917;68:910. DeLee JB. Ein nues stethoskop fÃ¼r die Geburtshilfe besonders geeignet. Zentralbl Gynaekol 1922;46:1688. Goodlin R: History of fetal monitoring. Am J Obstet Gynecol 1979;133:325. Whitfield CR. Foetal heart rate monitoring--present lessons and future developments. The Ulster Medical Journal. 1966;35(1):75-82. American College of Obstetricians and Gynecologists, authors. ACOG Practice Bulletin No. 106: Intrapartum fetal heart rate monitoring: nomenclature, interpretation, and general management principles. Obstet Gynecol. 2009;114:192–202. Stampalija, T., Signaroldi, M., Mastroianni, C., Rosti, E., Signorelli, V., Casati, D., & Ferrazzi, E. M. (2011). Fetal and maternal heart rate confusion during intra-partum monitoring: comparison of trans-abdominal fetal electrocardiogram and Doppler telemetry. The Journal of Maternal-Fetal & Neonatal Medicine, 25(8), 1517–1520. Murata Y, Martin C: Systolic time intervals of the fetal cardiac cycle. Obstet Gynecol 1974;44:224. Fukushima T, Flores CA, Hon EH, et al. : Limitations of autocorrelation in fetal heart rate monitoring. Am J Obstet Gynecol 1985;153:685.